A handful of new hamstring pulls at your local physical therapy clinic! I joke, but I’ve seen it first hand. Last year when we started working with the Indy Eleven soccer team, more than a handful of the guys were dealing with hamstring or groin pulls. So the question becomes, why does someone strain their hamstring? And equally as important, how do we address the underlying issues to keep this from happening time and again? Now I would be remiss if I didn’t at least mention the Postural Restoration Institute here, as their philosophy and way of thinking has had a profound impact on our work at IFAST. So if you haven’t checked them out before, now would be a great time to do so. But enough idle chit-chat – let’s talk hamstrings! While it’s easy to go the reductionist route and say there’s only one reason that people pull a hamstring (i.e. poor strength, poor flexibility, or whatever), that simply is not the case. Now I’m not a physical therapist, nor do I play one on TV. I’m a performance coach so I’m going to focus more on prevention side of the equation vs. how to rehab an acute hamstring strain. With that being said, here’s a four-pronged approach to reduce the likelihood of hamstring injury with your athletes. 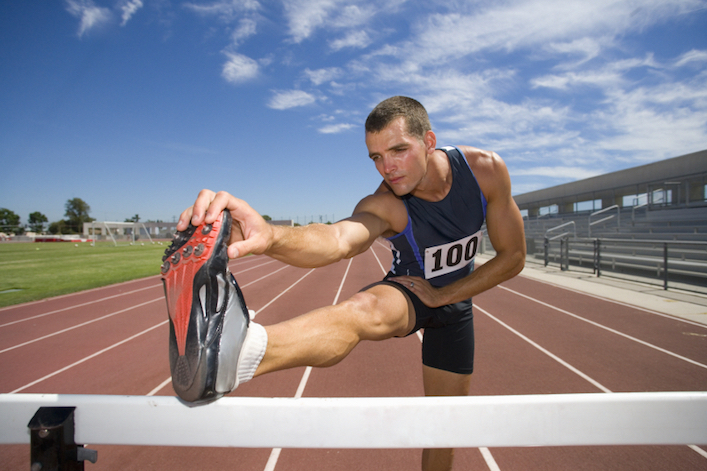 The starting point for improved hamstring health is improving posture and position. Now I know what some will tell you – that posture can’t predict pain or dysfunction. And on one hand, they’re absolutely right. I’ve seen some of the most toned-up, deep backed, anteriorly tilted pelvises known to man, and these athletes don’t have a hint of pain. But I can also tell you this – just because it isn’t a problem now, doesn’t mean it won’t be a problem down the line. More times than not if they continue down this path, or don’t improve stability through the anterior core and pelvis, they’re a pulled hamstring (or groin, or quad) waiting to happen. If you came to IFAST for a training session, the first thing we’d work to do is reposition your pelvis. The beauty of the individual assessment is that we figure out the exact repositioning exercise that works for you, but give this one a shot if you’ve never tried a reset before. One other thing to note: The goal here isn’t necessarily to give someone “perfect” posture (whatever that is), or to get rid of all of their anterior tilt. If you’re working with an explosive athlete, extension isn’t necessarily a bad thing – it often makes them fast, powerful, or explosive. It’s a checks and balances system, and you need your athletes to be able to control extension. Improving posture or position can go a long way to helping you do this. Once position has been improved, now it’s time to actually strengthen the hamstrings. If you’re immersed in the soccer community, you know that everyone wants to talk Nordic hamstring curls. And if you’re not in the soccer community, a Nordic hamstring is simply an eccentric only glute ham raise. Many athletes don’t have access to a glute-ham machine, so they do this version where a partner sits on their ankles and they slowly lower under control. Most athletes perform the exercise incorrectly. We’ve used the Nordic hamstring with the Indy Eleven for the past year or so now with great results. In fact, by the end of last year we only had one guy on our team who was dealing with hamstring issues. However, we didn’t just blindly jump into the movement – especially since we didn’t start training the team until the competitive season started. If you’ve ever performed any version of a glute-ham raise, you know his is NOT an easy movement. Even 2-3 sets of 3-5 reps could leave your athletes sore for days. Instead, we had to slowly but surely build strength and resiliency in the hamstrings over an eight week period. Second, like every exercise it’s not just the fact that you program it for your athletes, but how you actually coach it that makes it more (or less!) effective. When performing the Nordic hamstring with our athletes, we cue them to “get abs” first. To do this, we have them exhale to bring the rib cage down, and then think about rolling the pelvis underneath them. This restores the pelvis to a more neutral position, and gives the hamstrings an improved position to work from. If you use an appropriate progression to get the athletes’ hamstrings prepared for the movement, and combine that with improved coaching, I guarantee your athletes will be healthier as a result. When it comes to hamstring injuries, it’s obvious that strengthening the hamstrings is important. The “pull down” on the back of the pelvis, which helps restore a more neutral pelvic alignment. But I think too often that’s all a coach focuses on, when simultaneously, they should be placing an equal emphasis on controlling the front side of the pelvis as well. If an athlete lives in a position of extension from top-to-bottom, the front of the pelvis is tipped forward. And when the front of the pelvis is tipped forward, the abdominals are put into a lengthened and weak position. Now keep in mind, your athletes may have abs that look as though they’re chiseled out of granite – especially the rectus abdominus, or six-pack muscles. But good looking abs, and abs that can control your pelvis and low back position, are often two entirely different things. What we need in this case are obliques (both internal and external), and a transverse abdominus that can help control the pelvis from the front. How do we do this? I’m glad you asked! To begin, it all starts with an exhale. Just like the Nordic hamstring, a full exhale allows our lower rib cage to come down, and our pelvis to “tuck” underneath us slightly. From this position, every single ab exercise that I’ve discussed in the past (leg lowering, dead bugs, planks, etc.) will be more effective. On the other hand, if you’re starting these exercises in an extended posture (or state of inhalation), you’re going to consistently miss the mark. The biggest issue we see is that fatigue impacts posture and position, and we know poor posture and position can drive compensated movement. In soccer, it’s been shown that the likelihood of hamstring injuries increases towards the end of each half. So we could do all the right things in the gym with regards to repositioning the pelvis, strengthening the hamstrings, and stabilizing the core/pelvis, and still get injured if we can’t resist fatigue! Now this is a whole ‘nother can of worms that I’m not going to dive into in this post. However, I firmly believe you need a mix of energy system training and development if you want to keep your athletes healthy. My general recommendation is to develop a low-intensity base first, and then follow it up with more intensive methods to widen the aerobic window. From a tactical perspective, smart substitution patterns in every sport can make a huge difference as well. At the end of the day, just remember that you can’t talk about a holistic hamstring health program and not discuss proper conditioning. BONUS Hack #5 – Stop Stretching Your Hamstrings! I think at one point or another, we’ve all been on the “hamstring stretching” or “tight hamstrings” bandwagon. Because outwardly, it makes sense – if someone is tighter than cable wire, then they need to stretch. Right? If you’re dealing with an extended athlete (anterior pelvic tilt, deep lumbar lordosis, anterior weight shift, etc.) then their hamstrings are in a long and neurologically weakened position. So you know what stretching will do? That’s right boss – it’s going to make them LONGER and WEAKER. At the end of the day, does it really make sense to strengthen the hamstrings (i.e. restore the pelvis to a neutral position) and then stretch the hamstrings (i.e. allow them to come back into anterior tilt)? I’ll let you answer that, but I think you already know the answer. So there you have it – a four (and really five!) step approach to getting your athletes’ hamstrings healthy once and for all. Use the tips I’ve provided above, and I’ll expect to hear back from you when your athletes are moving and feeling better than ever! I read somewhere that hamstrings are pulled when the quads are to strong not the hamstrings to weak, or imbalance is the cause of pulling the hamstrings.. Eliminating quad dominant exercises can help decrease hamstring injuries, or pre exhausting the quads before any leg exercises to emphasize hamstring involvement. Tap dancing to Broadway show tunes help as well. Yeah I’ve seen all that research as well, I just think it’s incredibly myopic in nature. Rather than looking at an isolated muscle imbalance, why not address the systemic/global issues that the athlete presents with? I guarantee if you follow the information outlined above, you’ll work to “correct” any quad:hamstring muscle imbalances. Sorry if that sounds snarky – it’s not geared towards you, but rather the limited thinking that we tend to see when addressing issues with our athlete. Actively driving excessive extension or flexion through the spine (especially at end range) is never a good idea. Furthermore, loading this kind of pattern sounds like a recipe for a disc herniation. Just my .02 but I would avoid them. Great article. And I agree focusing on quad:hamstring ratio CAN be important, but only in context of pelvic position. Absolutely Josh – great point! Nice post. Just one thing – I’m surprised you didn’t mention deadlifts, stiff legged deadlifts, and Romanian deadlifts in the section about strengthening the hamstrings. Great video. IMHO: field research matters, sometimes more than the lab stuff. Good to hear you are having success with this exercise. Please keep us updated on the progress of your consistency and its effectiveness. Fatigue is the enemy, both in the short and long run. Many years ago I took A USATF cert. Hamstring pulls and sprinters go hand in in hand. So the question came up. The instructors response was RDL with a 2 second pause at the bottom. He said in 5 years as a sprint coach at his school he’s never had one pull. This kind of falls into line with you and getting your hamstring stronger. 1) Viewed GHR’s at several sites there seems to be differences in the way they’re performed and the setup. In some, the feet stay flat on the plate as opposed to the athlete rising up on their toes. Thoughts as to which is best or no difference? 2) Myself, and at most sites the person rises up to an almost vertical torso position; Dr Yessis advising that this is not needed. Again, any comments? 4) Most videos I’ve seen, and myself as well, start from either a head down and hip/torso angle of 90deg, some from what you could call a plank position; i.e., head, shoulders, hips, knees in alignment…..your video doesn’t seem to advocate those starting positions. Thoughts would again be appreciated. Fascinating article, thank you. Are you able to provide any extra insight as to why so many athletes live in anterior tilt and how this relates beneficially to their performance? As you state, extension (I assume at hip rather than lumbar spine) is vital to speed and power. I hope I understood this correctly. Yes yes yes! Thank you! The answer to a pulled muscle is not always to just stretch. Stabilization and strengthening are key to preventing hamstring issues. For the context of this article number 5 makes sense. But at the end of the day you’re still blindly throwing darts at a dart board. You need to perform a proper assessment (SFMA, etc.) before making any decisions on your plan of attack. How can you fix a dysfunction without knowing the cause? Is it TED, JMD, SMCD, or a combination? If youre a S&C coach without the appropriate knowledge for such an in depth assesment, then you should seek to find help. Or you will just end up making things worse unless you get really lucky. But at the end of the day everybody can use more trunk stability/motor control and conditioning. Any comment as to why when people first try the Glute Ham Raise they tend to get cramps in the hamstring – but that goes away. What is it about the intense focus on the hamstring that makes this phenomenon? I can’t think of any other muscle group that experiences anything similar (Quads, for example). What if someone has Posterior Pelvic Tilt? Does your advice on not stretching still apply?